When starting out your investment banking career, chances are that you hope it would get you to Wall Street rather than to 5th Avenue. Still, with investment banking being a client-facing business, you will be expected to look presentable at all times. Not to mention that the job also entails certain social status and hierarchy meaning that your clothes should give the right vibe not only to the clients you work with, but also to your peers and superiors. While you’re likely to be hired for your knowledge of financial modeling, and your negotiation and sales skills rather than for your fashion sense, something seemingly as silly as clothes might trip you up while you’re climbing up the investment banking career ladder. That is why it is essential that you know at least a few basic investment banking dress code rules. Though there are slight differences from investment banking in New York to those in London or Singapore, these guidelines will help you dress to impress from your first day on Wall street. So how to dress like an investment banker? It would hardly come as a surprise that if you’re working at an investment bank you would have to suit up. Still, not every suit would do; in terms of colors, steer clear from brown, green and light colored suits and stick to medium-to-dark gray and navy or business suits. Black is also an option, but since black suits are more appropriate for formal occasions such as weddings and funerals, you might want to leave those in the wardrobe unless invited to a formal dinner. Don’t ever wear different colored jackets and pants. Long-sleeve dress shirts are a must, with the safest colors being white and light blue. Light pink or lavender shirts might also work, although they are less safe options. Avoid shirts with pockets, collar buttons, and patterns. As for ties, a conservative silk tie would do, with the Windsor and half-Windsor knot recommended. In terms of colors, stick to a maximum of three in a tie. When in doubt, go for a solid red or blue tie. When it comes to shoes, you should go for the low-heeled, conservative dress shoes option, and step away from the square-toed, wing-tipped or brogue shoes. While your shoes should be color-coordinated with your suit, black is usually acceptable. Don’t forget the socks either, calf-length dress socks which match your suit are what you should opt for. Moving on to accessories, remember to wear a belt if your pants have belt loops. In terms of color coordination, the belt should match the shoes. Don’t be the guy that wears suspenders. Just don’t. As for jewelry, the only items acceptable for a man are a wedding ring, a watch and cufflinks. Leave the bracelets and the pinky rings and chains at home, should you have such. These are only acceptable if you’re in Eastern Europe and/or are a mafia kingpin. While there are plenty of tips out there how to dress as an investment banker if you’re a man, a women’s guide is more difficult to find. It is true that the dress code for women is less strict especially in terms of colors, but still, there are a few clothing pitfalls for the female investment banker. The general rule is that you have to project the right message, meaning that you need to look both stylish and professional. Either a skirt or a pantsuit is usually fine, accompanied by shirts in your most complimentary colors. As is the case with men, you can’t go wrong with a navy-blue or medium-to-dark grey business suit. Low-heeled conservative dress shoes color-coordinated with your suit are the way to go. While you don’t need to worry about socks unlike your male colleagues, hosiery is highly recommended, with skin color being the safest option. When it comes to jewelry, rules for women are much more relaxed. While extremities such as hoop earrings or piercings that aren’t your ears are off the table, even in Jersey, you can still resort to jewelry to highlight your feminine side. As long as they are tasteful and in moderation, you can opt for earrings, rings and necklaces. And some final tips: stay away from bright color nail polish as well as flashy makeup, and go easy on the perfume. 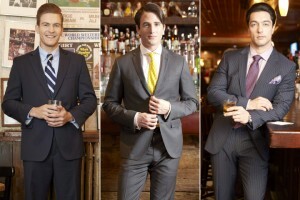 It’s worth noting that a lot of investment banks have “casual Fridays” when the dress code is much more relaxed. This, however, doesn’t mean that it’s any easier to decide what to wear. The business casual dress code generally entails khakis, golf or polo shirts, or a sweater over colored shirt for male employees. For women, business casual usually means trousers or a knee-length skirt and a blouse or a shirt with a collar. Tempted as you might be, it’s best if you stayed away from jeans and T-shirts. Though investment banking wardrobes are well covered it’s important not to make mistakes that will get you ridiculed. And while the above guidelines might seem somewhat stringent, you need to remember that investment banking isn’t just any office job. It’s not just about the work, but also the status and the prestige which are projected through clothing. Even though your professional skills are what matters if you’re considering a career in investment banking, if you are thinking about making it on Wall Street, it’s better that you leave the sneakers and jeans at home.